Bit Tech reports a store named Oakville Mehlville Computers was selling four 12-core AMD Magny-Cours processors on eBay, you can check out the auction over here. It's unknown how the seller got hold of these processors. 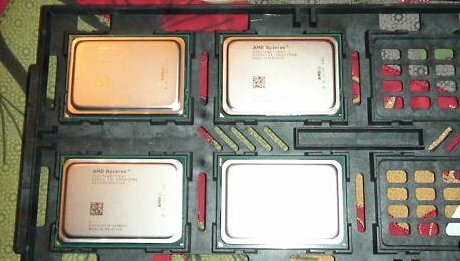 The as-yet unreleased dodeca-cored processors have popped up on the auction site under the user account oakvillemehlvillecomputers, available on buy-it-now at an eye-watering $7,700 (£4,880) for a batch of four 2.2GHz processors - designed for quad-processor socket G34 server systems and offering 48 logical processing cores to the host operating system. The chips have 6MB of L2 cache, split 512k per core, but also have 12MB of L3 cache and use quad-channel DDR3-1333 ECC memory in addition to several HyperTransport connection to link the chips.